We’re going to open the free transfer window from North America to Oceania for 2 weeks! The free window will open on January 23, 2015 and run through February 8, 2015. After that time it will go back to the regular price of 2,600 RP. Iâ€™m RiotPDB, and I head up the NA team at Riot. Iâ€™d like to provide some insight into our goals and plans when it comes to live community and esports events in NA during 2015. This past year, we attended more live events in North America than ever before. From Boston to Seattle to Toronto to Atlanta, we had a great time exploring new places and ways to interact with the community in person. Weâ€™re still learning and have lots of new things we want to tackle, which means further changes to our event strategy in 2015. Broadly, this year weâ€™re going to shift our focus away from some of the bigger cons and instead experiment with new event formats and, more importantly, new locations. One of the first changes youâ€™ll see is that weâ€™re toning down our presence at PAX East. Weâ€™ve had an amazing time there over the past few years, but this year weâ€™re scaling our presence down to speaker panels and the Cospitality Lounge for all the hardworking cosplayers. Similarly, thereâ€™ll also be a shift on the esports side as we wonâ€™t be hosting the NA LCS 2015 summer playoffs at PAX Prime in Seattle. PAX has been an awesome host for the finals the past two seasons, but this year weâ€™re exploring ways to bring that experience to even more players across NA. So whatâ€™s the upside? Well, you can expect at least five live League events across the US and Canada in 2015, and likely more. The specifics will vary between dedicated esports events and broader NA community events built around things like collegiate play or specific League topics (content creation, cosplay, etc), but the goals will be the same – to give players an ideal setting for sharing their passion for League with each other. When it comes to esports, this year weâ€™re planning to bring LCS to more esports fans across North America. This means more stops and events outside of the West Coast and more opportunities for esports fans across the region to join us for live events. Additionally, refocusing away from existing conventions like PAX gives us the chance to create a tailored experience for League players and esports fans, with venue setups specifically optimized for the live esports experience rather than the space and logistical restrictions that come along with being part of an existing con. Check out todayâ€™s announcement about our Mid-Season Invitational and All-Star 2015 for a sneak peek at just a few of the events weâ€™ll be sharing more details on soon. As the NA event scene continues to evolve, we want to make sure weâ€™re hosting amazing live events for League in different locations (all across the US and Canada) and for all types of players. While that means you might not always see us at the same events every year, it also means we can explore new venues and opportunities. Weâ€™ll be sure to keep you updated as we finalize our plans and give you plenty of advance notice for events, so keep an eye out for announcements on Boards and lolesports.com. As always, weâ€™d love your continued feedback as we provide further updates. Whether youâ€™re most interested in meeting pros, chatting with content creators, seeing cosplay, or watching matches (or all of the above! ), make sure to let us know and help us put together kickass League events in 2015. Hey, TheSleepingOne. I can say for sure I’ll still be attending PAX East so we shall definitely meet again and there are also going to be a lot of cool Rioters at the panels and helping at the Cospitality Lounge, so don’t feel like you can’t come say hi and talk to them. As last year we focused on attending a lot of anime/ gaming conventions, this year we switched the focus on different types of formats that will also allow us more flexibility on the location. It doesn’t mean we won’t be back there in the future and it definitely doesn’t mean we’re not going to have events outside of esports, on the contrary, as RedBeard said we’re looking more into developing esports events that have a lot of different elements to them including the community aspect, on top of the community events we’re planning for 2015. I totally understand your point of view and get that this isn’t ideal for you and other League players who have already bought tickets. That’s why we put together this announcement as soon as we knew our presence at PAX East would be smaller this year. Sadly, as you point out tickets already went on sale, but we wanted to at least provide this heads up so you’d know what to expect. Ultimately, this is a trade off that’ll let us explore awesome new event possibilities that hopefully you can all enjoy throughout the year. While our presence at PAX East will be different and definitely smaller, we’re still really excited about interacting with the community through panels, and I personally hope to see you there. Lux’s shield used to give her allies stealth/invisibility until they attacked. Azir’s passive (Tower resurrection) used to be his ultimate, except it shot lasers like Viktor E.
Ryze used to deal magic damage on his basic attacks. Xerath’s ult mode used to have no cooldown and each shot cost 20 mana on a 0.33 sec cooldown. Lucian used to have two independent auto attack timers. Rengar’s rework used to allow you to get an acceleration gate effect by running through bushes during your ult. Elise used to not be able to jump to her target in spider form, but could instead create webs that would ensnare enemies who ran under her. Vi R used to be 3 spells. She’d suppress you and then choose to WW R you, Malphite R you, or throw you across the map. Jinx R used to “Carpet Bomb.” She’d shoot out a global missile that would drop hundreds of Ziggs Q’s randomly around it as it flew. Jinx R used to be “Bring Down the Hammer.” She’d designate a location on the map and 4 seconds later a giant lazer beam would come out of the sky and annihilate anyone standing in the area. Soraka had AoE Mikael’s, a Penance look-alike channel heal, her silence zone used to pacify (no attacking in zone – one iteration it actually polymorphed you into celestial lulu cupcakes). Trist didn’t have anything to crazy. The other champion I’m working on updating though… oh man he’s had some craaazy stuff. [ Context ] There have been several complaints on Reddit about Nidalee disappearing after exiting a brush. Here’s the deal on Nidalee. With the 5.1 patch, we put in a change that we had hoped might be causing the visually glitchy movement with Nidalee. Due to the nature of the bug being difficult to reproduce (despite some people apparently seeing it every game? ), we did not document the change because we aren’t completely confident that it’s a fix. If anyone can provide a video and any other information regarding how to reproduce the bug on the 5.1 (so since this morning), it may be useful in helping us get it fixed. Equally useful to get us an idea as to whether it’s still happening may be if you were experiencing the bug before the patch and now aren’t, or you weren’t experiencing it and now are, or if you were seeing it beforehand and still are since the patch. Thanks in advance for anyone who happens to get a video of it happening on Live servers since this morning. There were some firewall and networking issues recently and we decided to turn LeaverBuster off to ensure that players were not mistakenly sent to low priority queue. When the server issues were fixed, we turned LeaverBuster back on, but the penalties weren’t firing. As a result of this, we’re seeing that some players who left/AFK’d in games after the firewall and networking issues resolved did not receive their penalty until this week. Sorry about the confusion! All low priority queue penalties should be granted immediately after leaving/AFK games now, instead of after a delay. People will serve the penalty for punishments they earned. We turned off enforcement in order to prevent people suffering from a known bug from being punished. We did this to help players. So yes, if a player earned a punishment, they do have to work it off. Maokaiâ€™s the latest champ to go into the champion update workshop, and has come out the other end with some fancy new bark to wear on all of his skins! Just like Singed, Maokaiâ€™s rig was in a fairly good spot while the rest of his look was a bitâ€¦ wellâ€¦ old. So we changed it up, updating his model, textures, spell effects, and a few of his animations on his base model and each of his skins! Maokaiâ€™s also received spooky new icons for his abilities. 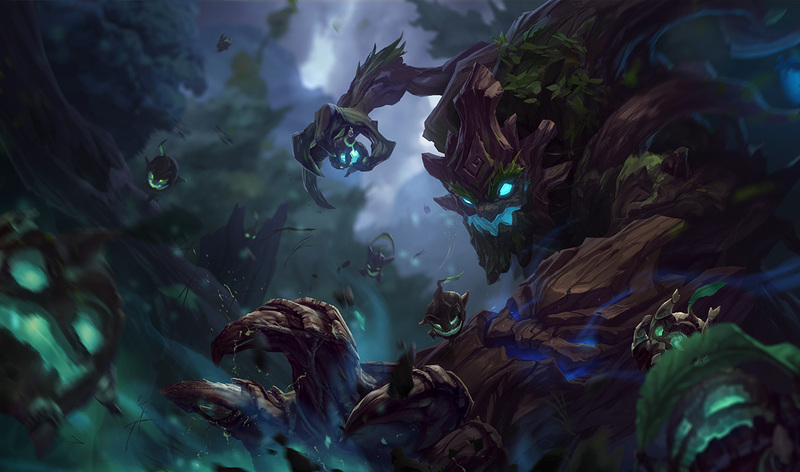 From left to right:Â Passive,Â Q,Â W,Â EÂ andÂ R.
Maokai has received heaps of new lore and his old lore has beenÂ replaced. Before the Shadow Isles became a land of death,the islands teemed with natural life and beauty.This was never truer than in the islesâ€™ sacred forest: a paradise of thriving trees and countless species, both animal and spirit alike. When the king of the Shadow Islesordered his sorcerers to crack open the barrier separating life and death, the forest served as a well of power the magi drank deeply from. The sorcerersâ€™ ritual succeeded in corrupting the cycle of life and unleashing forces they could not hope to contain.Vitality seeped from every living thing in the Shadow Isles: great trees withered into gnarled husks, people warped into twisted shades, and forest spirits became hollow wisps. Maokai, the strongest spirit of the sacred forest, watched in horror as his world crumbled and died around him. He fought to mend the wound in the world, but could not halt the destruction wrought by human folly. As the ghastly energies sought to overwhelm the great spirit, he made one last desperate attempt to preserve the life of the land. Maokai inhabited the ancient oak at the heart of the forestâ€™s spiritual power. There he gathered the essence of the isles into the tree as the corruption of undeath clawed hungrily at anything within reach. Fortified by boundless magic, Maokai could not be consumed entirely,though the spirit was not left unscathed. Maokai, now saturated with the essences of life and death, became fused with the ancient oak and contorted into an abomination. Forages, pain and grief were the only companions the spirit had. His boughs grew heavy as he wept at the desolation of everything he had known and loved, and his roots tore from the earth as he raged at the reckless sorcerers that had ruined his home. But all was not lost.Maokai had preserved the last vital spark remaining in the Shadow Isles, and with it, the hope of returning life to the land. Like moths to a flame, the tormented shades ofthe Shadow Isles were drawn to the living essence within Maokai. The spirit guarded theseed of life from the relentless undead, but Maokai knew he could not fend them off forever. He needed to escape the land of death his home had become, so he cast himself into the sea and trusted in nature to guide him towards a living land. There he hoped to find the means to cast out the forces of undeath and restore life to the Shadow Isles. [ Note ]Â The Preseason changes are up on the PBE. Theyâ€™ll be live with Patch 4.20. One of the other major goals on this project was to increase visual clarity for Maokai, his allies and his enemies. His ultimate is massively powerful, but was it ever really the most noticeable? Did his snare ever really feel as effective as it actually is? Could his saplings be even more awesome? We pushed these a bit, so hopefully youâ€™ll be able to feel the effects! Weâ€™d really appreciate it if youâ€™d take a look at Maokai, and hit us with any bugs and feedback that come your way. Your feedback helps to guide changes we can make, as well as helps us grow as a team. Between the update to Summonerâ€™s Rift and now this, it certainly is a great time for our trees. Maokai has received heaps of new lore and his old lore has been replaced. Before the Shadow Isles became a land of death,the islands teemed with natural life and beauty.This was never truer than in the isles’ sacred forest: a paradise of thriving trees and countless species, both animal and spirit alike. When the king of the Shadow Islesordered his sorcerers to crack open the barrier separating life and death, the forest served as a well of power the magi drank deeply from. The sorcerers’ ritual succeeded in corrupting the cycle of life and unleashing forces they could not hope to contain.Vitality seeped from every living thing in the Shadow Isles: great trees withered into gnarled husks, people warped into twisted shades, and forest spirits became hollow wisps. Maokai, the strongest spirit of the sacred forest, watched in horror as his world crumbled and died around him. He fought to mend the wound in the world, but could not halt the destruction wrought by human folly. As the ghastly energies sought to overwhelm the great spirit, he made one last desperate attempt to preserve the life of the land. Maokai inhabited the ancient oak at the heart of the forest’s spiritual power. There he gathered the essence of the isles into the tree as the corruption of undeath clawed hungrily at anything within reach. Fortified by boundless magic, Maokai could not be consumed entirely,though the spirit was not left unscathed. All upgrades of Hunter’s Machete now grant 5 Mana-per-second while fighting jungle monsters, increased from 4. [ Note ] If you want a rundown of preseason changes, I’ve written a guide that covers all of them. I’ll make sure to keep it up-to-dateÂ with PBE updates. From the Champion rework team comes a dev blog, detailing upcoming updates for Maokai, Tristana and Poppy. Hey guys, Seb â€œFruity Sebblesâ€ Rhee here â€“ Product Manager on the Champion Update team but really just one of a number of Rioters dedicated to showing love to Leagueâ€™s oldest but still beloved champions. 2014 has been a busy year for the team (though weâ€™re not quite done yet! ), and in the wake of our most ambitious project yet, the Sion update, Iâ€™d like to chat with you about what weâ€™ve learned this past year as well as where weâ€™re heading with future updates. We started off 2014 with a key adjustment to the teamâ€™s approach to champion updates. Â Previously, weâ€™d often pursued the gameplay, story, and art segments of updates in isolation from each other, which sometimes limited our adaptability (VUs were exclusively cosmetic, while GUs were exclusively focused on gameplay). Heimerdinger is an example of this older approach – development of the gameplay and art elements of his update were so disconnected that their releases were more than four months apart. We decided we needed to do a better job of treating champions as cohesive packages. By updating characters like Heimerdinger in piecemeal fashion we were certainly delivering new high-quality assets into the game, but we could have potentially even better served Heimer players by delivering a single, unified update. Ultimately we want champions to be distinct, cohesive, and well-executed realizations of their various elements – which requires that art, story, and gameplay all feed into and support each other. With this new philosophy in mind, we did some experimentation in the course of this yearâ€™s projects, focused on finding new ways to both maintain a high release cadence and deliver the best possible updates. The first step was better integration of gameplay as a fully-fledged part of the teamâ€™s repertoire. Earlier gameplay updates were often limited to addressing how champions negatively affected the game, such as with pre-update Xerath, Kassadin, and Rengar. Since then, our approach has evolved from fixing gameplay problems generated by champions to taking a broad look at their overall thematic in order to guide us in implementing the best version of that characterâ€™s gameplay. Nidalee, Sona, and Soraka are examples of updates seeking to better fulfill the gameplay promises suggested by champion identities – Nidaleeâ€™s shapeshifting is now a core part of her gameplay loop, and Soraka is dishing out heals every two seconds! And weâ€™ve found that tackling gameplay updates in this fashion still lets us solve the deep-rooted gameplay issues of previous implementations, while maintaining the feel of the original character. Another key development was realizing the potential for greater variety in visual updates. 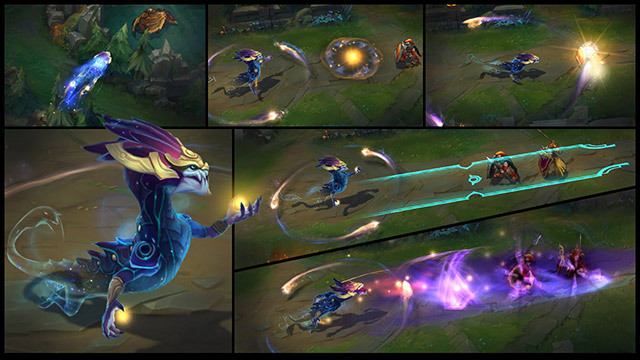 Back near the end of 2013, we took some texture-only passes at Rammus and Anivia while investigating new ways to quickly deliver updates to players. As non-humans with ratherâ€¦polygonal looks, they were obvious candidates for some safe experimentation. To our surprise these minor updates received really high levels of positive feedback, and in 2014 we decided to try out further low-scope art updates. After Skarnerâ€™s new visuals received a similar response, we decided to next take a crack at a non-creature texture in the form of Sona, even experimenting a bit further by packaging a quick model update along with her new textures. Once again, players reported satisfaction comparable to that of previous full-scope VUs – yet more evidence of the potential for low-scope but more frequent art updates to become an important part of the update pipeline. Finally, Sion represented a whole new level of comprehensive update. In a lot of ways Sion is the culmination of all of the changes weâ€™ve made to the team and its approaches. Instead of over-focusing on the issues with his previous implementation, we took a hard look at what SionÂ shouldÂ be and worked toward that goal from the ground up, across all aspects of the champion. Sion is the biggest project weâ€™ve taken on as a team, and we hope it sets a new standard in terms of what to expect from the largest-scale updates. Taken together, these various projects confirmed the potential for pursuing updates of varying scope. In addition to mammoth projects like Sion, we were able to fill the gaps with more focused updates and constantly deliver value. Viktor is a great example of the latter – he received efficient, relatively low-scope art and gameplay updates specifically targeted at bringing him up to current standards. Of course, this means we donâ€™t always get to finish the lower-scope updates with a shout of â€˜ITâ€™S PERFECT!â€™ and tears of joy. The animators may hate some of the old animations, or the sound designers may desperately want to incorporate expanded VO or new tech. But delivering high-quality, incremental updates on a regular basis can help make sure weâ€™re able to take a look at more playersâ€™ favorite outdated champions and move consistently through our backlog. This approach will be especially important as we look to finish off 2014 in strong fashion and move right on in to 2015. 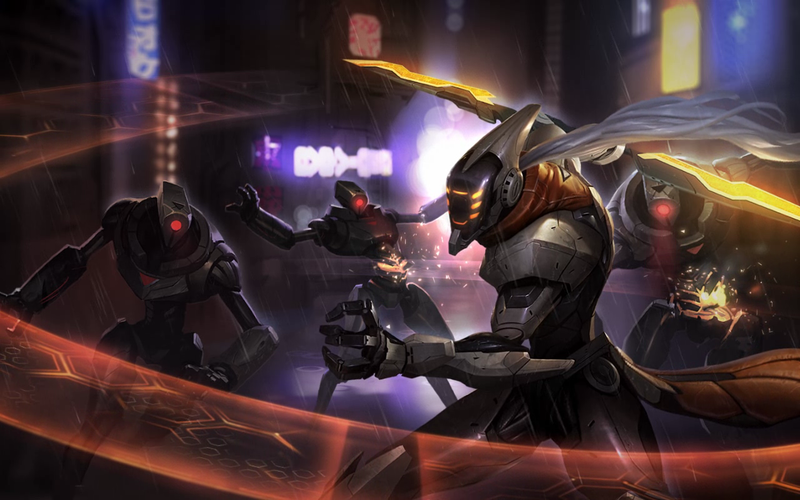 The scope of updates will vary immensely, from Sion-level projects to minor texture and gameplay polish efforts, all based on each championâ€™s specific needs and place in the overall roster. Following from the first, weâ€™llÂ simultaneouslyÂ pursue multiple updates of varying scope. Several pipelines will exist so that no champion is left behind because its unique needs donâ€™t fit the current mold. These principles are actually already in play – Sion, Viktor and Soraka emerged nearly simultaneously and with varying degrees of change. Moving into 2015, we plan to do updates in the Renekton to Sona range much more often than in the past, but in addition to Sion-level updates (not in lieu of them). In line with this thinking, weâ€™re moving away from our past attempts to strictly define update categories (older terms like relaunch and rework as well as the newer TU, MTU, VU, GU, etc). Visually-focused updates will often include gameplay tweaks or quality-of-life changes, while gameplay-driven updates will frequently include opportunistic or even necessary visual adjustments like new ability effects. Updates donâ€™t all need to fit a predetermined template, and each will be different in scope based on the championâ€™s needs – our goal is simply to get every champion up to the quality bar that players can expect of a modern League champion. But how will this play out in practice? Letâ€™s take a look at these concepts through the lens of several current projects that demonstrate the breadth of scope weâ€™re pursuing with updates. Maokai is the next update in the Singed / Renekton vein, as heâ€™s mostly in good shape and just needs some targeted work to bring him up to date. His gameplayâ€™s looking good after a kit rebalance earlier this season, so weâ€™re focusing on some low-scope visual buffs aimed at making him even more exciting to play. Heâ€™ll sport a whole new model and texture across his base and skins, and weâ€™re also taking a pass at his visual effects. Look for him to hit PBE soon! Tristanaâ€™s a consistently popular champion and might not seem an obvious update candidate, but sheâ€™s got a couple areas where a bit of work could bring her right up-to-date with current standards. As one of the gameâ€™s “intro” characters (you can unlock her for free on our Facebook page), we think itâ€™s about time Tristana received a buff to her visuals, especially given that Yordle style has evolved a bit over the years. While weâ€™re at it, weâ€™re taking a light pass at her gameplay focused on adding a bit of new spice to her E, increasing her ability interactions, and fleshing out her strategic niche among the roster of marksmen (errrâ€¦.markswomen…marksladyyordles). Sheâ€™s a moderately-sized project with significant investment and time commitments, but still focused on the specific areas in need of an update rather than more sweeping changes. Everyoneâ€™s favorite hammer girl has been on our scopes for a while, as sheâ€™s one of those older champions in need of across-the-board work to bring her up to current standards. To be clear, we LOVE her core identity – who doesnâ€™t want to play the fearless Yordle striking hammer-induced terror into enemies across the map? In fact, the gap between her awesome premise and lackluster execution is exactly why weâ€™re working on her. Artistically, Poppy will still look like a heavily armed and armored ball of golden death. Weâ€™re looking to preserve her thematic and color scheme while bringing her art up-to-date both technically and stylistically. Similarly, thereâ€™s a lot to love in her story, we just plan to bring it up-to-date and cement her more firmly in the world and among her fellow Yordles. On the gameplay front the challenge is a bit bigger, as Poppyâ€™s kit is pretty archaic at this point. Nevertheless, weâ€™re looking to keep her current fearless style of gameplay and core dash-and-smash mechanics – we still want her to have that same diver mentality. Poppy is definitely a hefty undertaking – not quite a Sion-level project but pretty close to it. Sheâ€™s still a ways out and is going to take a lot of work, but will hopefully offer an awesome experience for players once weâ€™re done with the job. As Iâ€™ve mentioned, these and other updates will vary tremendously in scope as we tailor them to each championâ€™s unique needs and opportunities. Keep in mind that this is nowhere near an exhaustive list of our current projects, and if your favorite older champion isnâ€™t included, fear not! He/she/it is somewhere on our radar, and we hope for an even better cadence in 2015 as we continue to incorporate our latest learnings. Weâ€™re incredibly excited about the future of Champion Updates, and we hope youâ€™ve enjoyed this exploration. Be sure to let us know what you think in the comments below! [ Note ] Maokai’s visual update isn’t available on the PBE at the moment. One of the other major goals on this project was to increase visual clarity for Maokai, his allies and his enemies. His ultimate is massively powerful, but was it ever really the most noticeable? Did his snare ever really feel as effective as it actually is? Could his saplings be even more awesome? We pushed these a bit, so hopefully you’ll be able to feel the effects! We’d really appreciate it if you’d take a look at Maokai, and hit us with any bugs and feedback that come your way. Your feedback helps to guide changes we can make, as well as helps us grow as a team. Between the update to Summoner’s Rift and now this, it certainly is a great time for our trees. You guys are awfully excited about him coming out in 4.20 for some reason. Maokai’s received spooky new icons for his abilities. 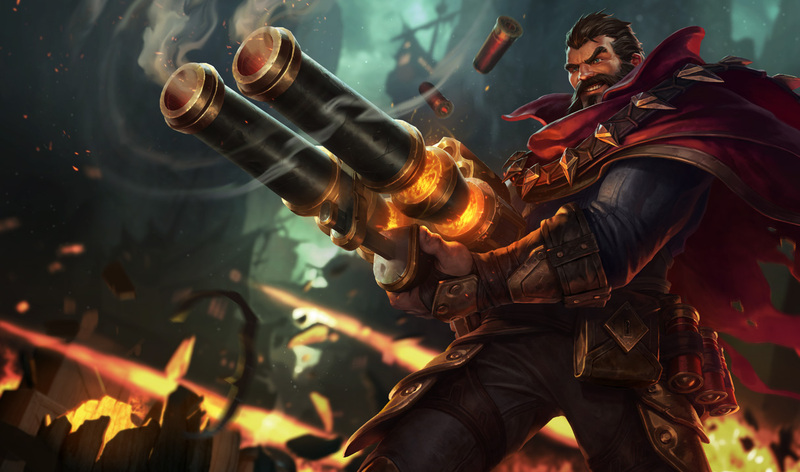 From left to right: Passive, Q, W, E and R.
Graves has turned to a healthy lifestyle and has ditched theÂ cigar in his updated splash. IP Boosts and XP Boosts have received new icons in the store! I tried to sound excited.